I’m going to Walt Disney World in just 24 days, for WDW Today Reunion 2013! But I have some concerns about the use of active and passive RFIDs in the new MagicBands, and of passive RFIDs in the resort hotel room keys. 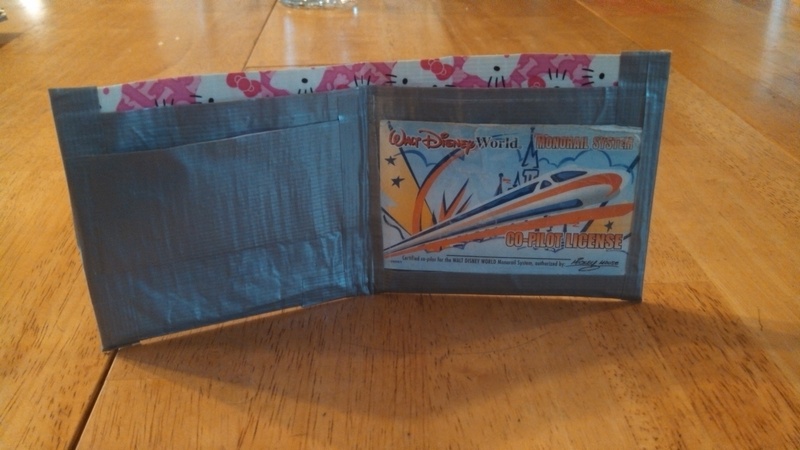 So, I’m planning to skip the MagicBand and just stick with the room key, which I can store in this nifty RFID-blocking wallet I just made with a little help from Instructables, a few things I had around the house, and some cute Hello Kitty duct tape my sister-in-law gave me. The RFID-blocking component is aluminum foil, sandwiched between two sheets of duct tape to make the main body of the wallet. Note the fancy-schmancy Monorail Pilot license in the ID holder! 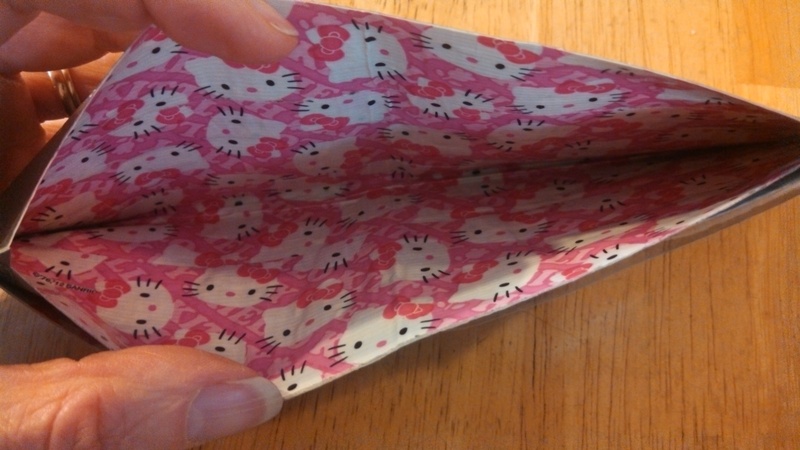 Lining of the money pocket and the change pocket (not shown) is Hello Kitty. It took about 90 minutes to make the wallet. I think it would go faster next time, since I had a little trouble at first working with the duct tape. The Hello Kitty duct tape was more forgiving than the standard silver duct tape when it came to accidentally sticking things together and having to pull them apart, perhaps because the cutesy patterned duct tapes seem to have been designed primarily for crafting, not taping ducts (which actually turns out to not be a good use of duct tape, nominative determinism notwithstanding. I might just make a little pouch for Magic Bands, too, but I haven’t been about to find good sources on whether active RFIDs are blocked by aluminum foil; I’m trusting Consumer Reports that the foil blocks passive RFIDs. And yes, a tinfoil hat will be necessary, strictly for fashion purposes. A project for another day. Okay, I booked flights for my next Disney trip just knowing about Reunion . . . but now I’ve discovered that AllEars.net also has a great line-up of meets this December 8-11, 2011. But I probably shouldn’t have even said anything . . . because some of these events have very limited capacity and I don’t want y’all buying up the tickets before I have a chance! Tickets go on sale sometime in July. I’m really glad to see both fan meets will be in town, in part because they’re operating with different business models. For Reunion, there are significant benefits to booking through the event sponsor, as you get tickets to a special reception, and you can buy tickets for hard-ticket events before the general public. But if like me, you’re using frequent flier miles and staying in your own time share, this means that booking through any travel agent isn’t really an option. So, I’m glad there’s another option now with AllEars, where I can just obsessively check my email and other electronic feeds to see when tickets go on sale, and hope I get in early enough. Checking now . . . and now . . . and now . . .
Watch out world! The frequent-flier gods have smiled upon me, so I’ve just booked my flights for WDW Today Reunion 2011, December 8-11, 2011, at Walt Disney World. I had a fantastic time when I attended the WDW Today Reunion and other fan meets in December of 2009, and I’m looking forward to meeting up with both familiar faces and new friends this year. There are only a few meets on the schedule so far, but it’s still more than 200 days away so I’ll bet more will be added. I’m definitely looking forward to filling up a Starspeeder, and giving Babycakes another chance. Plus, one of the great things about these fan meets is that people tend to be super-friendly, so if you’re traveling solo it’s easy to meet up with like-minded Disney geeks and hit the rides together, grab a meal, or just plain geek out over the difference between the Haunted Mansion variations worldwide. Booking packages through MouseFan Travel brings certain perks (I particularly envy the VIP event and priority standing for event ticket purchases), but isn’t required for Reunion attendance. Reunion registration is free, not required, and online now. D23 Magic and Merriment: A Shift in the Wind? Wow, D23 really does seem to be positioning itself as the only-slightly-wealthy-man’s Club 33. Its Magic and Merriment at Walt Disney World event this December 12-13 is designed and priced for the higher-end tourist, and not packaged to be appealing to Annual Passholders. When I booked this December’s trip for the fan meets, I knew D23 had something brewing. I’d hoped that it might be something of moderate price, that didn’t require a full weekend’s commitment of time and money. The event features two days of events, and is open only to D23 members, who’ve paid $74.99 for the privilege of spending more money (and, well, a magazine that I do hear is kinda nifty). The event itself is $195 per person, which includes (among other things) two one-park one-day tickets, two tickets to Disney Quest, admission to Mickey’s Very Merry Christmas Party, a dinner, and a luncheon. That’s not that bad a deal if you don’t already hold an Annual Pass, given that a two day non-hopper park admission is $166.14. But where’s the love for Annual Passholders, who don’t need the park entry? Well, they might want to do what many have when using the Dining Plan: Buy the one-day required Magic Your Way ticket and hold onto it for future use, such as using it as credit towards a future Annual Pass renewal (which I will give a try in December with that one-day pass I’m still holding from Free Dining 2007). But wait……the fine print lets you know that “Park tickets and Disney Quest tickets must be used by December 30, 2010,” so unless you’re renewing that pass soon, better nix the idea. And actually, I don’t know for sure that these tickets can be applied to future purchases as most Magic Your Way would be, so don’t go trying that on my advice please! It certainly does sound like a festive, pampering event, and I’ll confess to a bit of envious temptation brewing around the corners here, daring me to spend my allowance on a bit of decadence. But I doubt I will, in large part because I may well be too busy partying with my friends at the fan meets that same weekend. Such a shift in the wind would certainly be what Disney seems to be aiming for. Disney’s use of blogs, podcasts, and social networking technologies has lagged behind the fans’ use, and no doubt their recent offerings such as the Moms Panel and the Disney Parks Blog leverage the critical mass of online fan community that fan sites have nurtured over the years. And then, there’s the money thing. There are already class divisions in the Disney fan community, and awkward moments in conversations about money. I always find it somewhat odd when people respond to my staying at a Value Resort or off-site by explaining that they really “prefer” more luxurious lodging, as if my choice of hotel is solely motivated by enjoyment of less-posh surroundings, and a desire for longer lines at check-in. I don’t have a problem with the fact that some people have larger vacation budgets than I. (After all, I’m currently holding a Disneyland Paris Annual Passport, and will soon concurrently hold one for Walt Disney World as well, so I can hardly claim any sort of deprivation.) But let’s face it: Money matters in our vacation choices, and the level of one’s income (and obligations) affects one’s options. But the great thing about fan community grassroots events is that, once you get yourself on-site and into the park, the playing field is pretty much level, at least in terms of class and money issues. We can all watch the parade together. Will I do some spreadsheet crunching to see if there’s any way I could justify this expense? Sure. Am I likely to go? Nope. So hey, if you’re not going to the Magic and Merriment showing of Osbourne Lights that Saturday night, come on over and look for me at the WDW Today Reunion meet at Port Orleans Riverside to see Yee Haw Bob. Or swing by after the Osbournes — I’m sure the party will run plenty late!